Powerful, reliable, versatile. “Work” isn’t just in its name; it’s in its DNA. No matter what you throw at it, there’s just no stopping WorkStar.® With the broadest range of available powertrain options, it can muscle its way through even the heaviest loads and the most rugged jobs. Couple that power with an electrical system that offers body control functionality and more efficient diagnostics, and you’ve got a truck with the brains and brawn to keep your business running at its best. Huck-bolted frame and crossmember system designed for maximum vocational durability with a number of frame-rail options. When tough work is the daily test of your mettle, rely on the power and rugged performance of International® PayStar®. With an extra-strong frame-rail, 5-piece cross-member system and Huck-bolted chassis components, the PayStar frame is built to scale the highest peaks or reach the most inaccessible areas. Offering 120,000 PSI rails, and up an RBM up to 4.87 million in-lbs for maximum strength-to-weight ratio. Which means it can haul more, get more done and stand up to the daily beating the job dishes out. WorkStar offers up the performance and reliability you need to make the pick-up every time, take it where it needs to go, and start all over again. People depend on you, and with WorkStar, they’re not disappointed. When you rush to the scene, rush confidently. Make no mistake, the International® WorkStar® is built to back you up. Whether that means carrying extra equipment or traversing difficult terrain to get to the rescue, your crew must perform at the highest level of efficiency, productivity and safety. Fortunately, WorkStar is a vehicle that brings the heat no matter how adverse the situation. This job demands a truck that’s always on call, day and night, without fail. There’s simply no room for excuses. WorkStar responds with unmatched reliability, durability and remarkable service. When the lights go out, this truck shows up. That’s why you count on the International® WorkStar®. 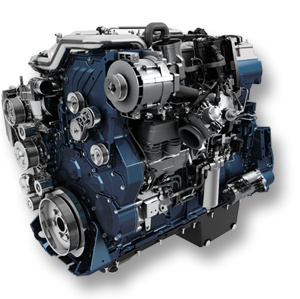 With the broadest range of powertrain combinations and a cooling capacity that can handle engines up to 475 hp, The design of the WorkStar keeps the radiator above the frame rails and out of the way for FEPTO mounting. WorkStar is a true multiple shift workhorse…with no choice but to be up and running, all the time. Ready for anything. Prepared for the unpredictable. Capable beyond expectations. That’s what WorkStar delivers. Because, when you’re at the service of an entire city, there’s no telling what you’ll be doing, or when. Mile after mile, ton after ton, through tight alleyways and city streets, your International® WorkStar® is there for you. In this case, picking up what others leave behind. 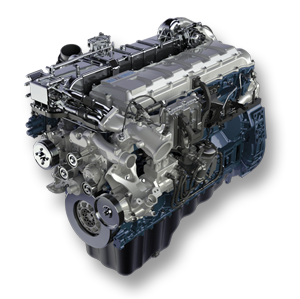 With a variety of engine offerings and a standard, Huck-bolted frame-rail system, you have what it takes on the road or at the landfill. It’s all about being durable, but durability doesn’t come at the expense of comfort. A wheel cut up to 50° and greater visibility from a panoramic, wraparound windshield make maneuvering a breeze while the roomy air-suspension cab provides a smooth, comfortable ride. What does the purchase of Continental® Mixers by Navistar® mean to you? An integrated International® WorkStar®mixer that provides greater functionality and easier diagnostics. Thanks to the Diamond Logic® electrical system, the WorkStar chassis and Continental mixer work as one–a seamless integrated unit. In fact, the WorkStar won’t drive above 5 mph if the mixer drum isn’t turning. Or its chute isn’t locked. Or its air hopper is raised. An integrated WorkStar mixer also means one-stop shopping for purchasing, parts, service, warranties and support at select International dealers. Talk about making your life easier. And your business more productive. Keeping your customers supplied with essential utilities is no small feat. Fortunately, International® WorkStar® is no small truck. Huck-bolted frames provide maximum durability. And factory engineered all-wheel drive means WorkStar can go where other utility vehicles can’t. Add that to the ease and efficiency afforded by the Diamond Logic® electrical system, and you can see how WorkStar delivers exactly what you need, when you need it—so you can always be confident the job will get done. 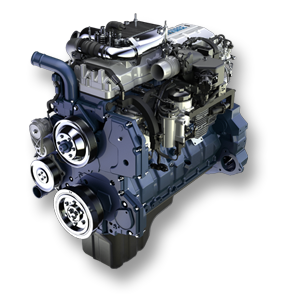 Navistar Big Bore engines deliver outstanding fuel economy, excellent power characteristics, and exceptionally smooth and quiet ride, and high strength without added weight.